Dr Jengo's World: Mafia 3 Collector's Edition revealed! 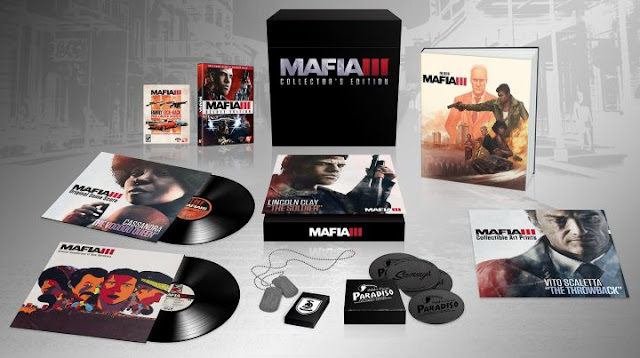 Mafia 3 Collector's Edition has been revealed! - Two 180-Gram Vinyls, one will feature an assortment of greatest hits from the 1960s, including music from Otis Redding & Carla Thomas, Sam Cooke and The Animals - and the other will feature the game's soundtrack. A cool Collector's Edition, with a nice theme to the collectibles but not my type of thing. Firstly, the vinyls will definitely be a waste as I won't be able to play them. Secondly, I love statues but there's no statue in this CE or any replica-type of collectible that I can put to display. Just might be skipping this CE but will definitely be getting the game.